The pic says it all…. 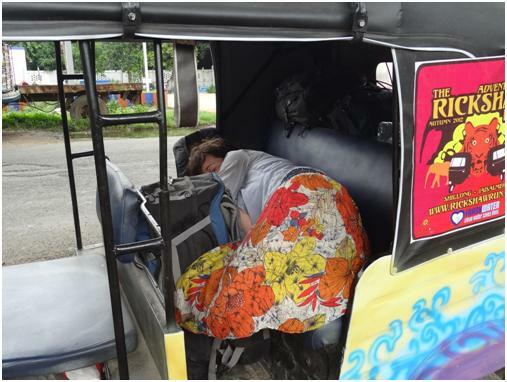 Laura catching up on the zzzzz’s in the back of Tuktanic. Some 4:00am starts taking a toll and we have long known Laura is NOT a morning person, in fact she has the amazing capacity to to fall a sleep just about anywhere. Driving the tuk takes a lot of concentration and energy. For starters we are building left arm muscles just to get the bleedin’ thing started. It has a crank handle that needs a violent jerk upwards to get the engine going. Then there are the blisters on the palms of our hands. The vibration goes right through you. No power steering you need to keep a tight grip to keep going in the right direction. Laura and I are pretty lucky for space as there are only two of us, the rest of have three passengers. Just the two of us means whoever is not driving gets to stretch out on the back seat. At the start, back in Shillong a couple of teams turned up thinking they were going to get four people in a tuk with their luggage… no chance. One guy turned up on his own which will make for some challenging driving with no rest. His main concern was just being alone, so he picked up a goat to keep him company. No idea how they got on or if the goat decided to stay.